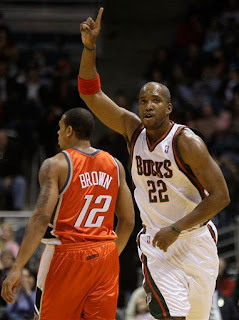 Redd, Bucks Stay Hot Over Bobcats ~ The Bucky Channel - The World of Sports from Wisconsin's Perspective. Michael Jordan made a rare appearance to watch the team he currently owns as they visited the team he almost bought, and he couldn't have been too happy. You would think that the Bobcats would be a little more motivated to play when MJ is in attendance, but that was not the case. They looked completely flat as your hometown Bucks destroyed Charlotte 105-73. Jordan may have been turning heads with his attendance, but it was a different Michael that stole the show. Mikey Redd lead the Bucks with 31 points, with 18 of those coming in the first quarter. "You have nights like this sometimes where everything feels good," Redd told the Associated Press. "My teammates did a great job of getting me the ball and I was able to hit some shots and get in a good rhythm." Also in a good rhythm was Charlie Villaneuva, who contributed with 27 points. Charlie V has been playing well this season, but he still remains the subject of many trade rumors. The Bucks also got 18 points out of Richard Jefferson. It was another great performance by the Bucks as they continue to play impressive basketball. Milwaukee (16-18) is now 7-3 in their last ten games as they seem to really be buying into Scott Skiles system. They'll have a chance to improve on that record Saturday night when they travel to Charlotte to conclude the home and home. Look for Michael Redd to try to repeat the performance he gave for Michael Jordan. "I'm sure he will say something to me before the game tomorrow and it won't be positive," Redd said. You put the Score in the Box and you shake them both together. TBC's Buck of the Game: Mike Redd.